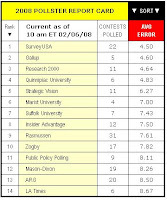 The Paradox of Vision: How Accurate Are Those Political Polls? How Accurate Are Those Political Polls? Via Firedoglake (and other places, it's being passed around), a compact little graphic illustrating how accurate those ever-present political polls are. The statistical analysis is here.